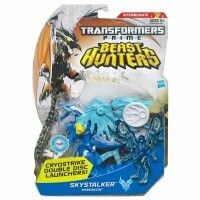 Seibertron.com member reluctantyouth has let us know that Transformers Prime Deluxe wave 3 is now available on Amazon.com. The wave features the heavily remolded Ratchet, new Predacon Skystalker, and new mold Dreadwing. Each is priced at $16.99, but ships free with an Amazon Prime account. Click the images mirrored below or the previous links for their respective order pages. You can also let your local friends know about your new finds in our Sightings Forum. Don't forget: free shipping on orders of $25 or more if you select Super Saver shipping. Sometimes it takes longer, sometimes it arrives the next day. Wow Deluxe's are way to expensive these days. I remember in the good old 90's Deluxe's used to be 10-12 bucks. I hate how stores wanna charge 18 bucks for Deluxe figures and online stores do as well. No Deluxe is worth almost paying Voyager prices. I don't know if this is the standard, but I noticed my cart defaulted to the very expensive 2 day shipping option. Be careful you don't rush through checkout. Fortunately, super saver shipping is available as all 3 of these will run you about $51. Got Skystalker from Amazon. It was pristine. They went out of their way to pick a good one, it seems. Oh, and I LOVE the figure. Too bad I wasn't interested in the other two. And no Prime on my Amazon, so shipping costs were added. =\ Still, glad to have him. Autobot_Benz wrote: Wow Deluxe's are way to expensive these days. I remember in the good old 90's Deluxe's used to be 10-12 bucks. You can blame inflation for that one. It's not the only factor at work, but it's there. I can't wait to find Skystalker. HE WILL BE MINE! If it's more than MSRP, chances are it's not Amazon selling it; it's a third-party vendor. That third-party vendor could be anything from some dude working out of his garage to a large online retailer like BBTS. If Amazon itself is offering the product, it'll be MSRP. These three figures are the same exact price at TRU. i have amazon prime so if i order one i get free shipping. not sure about skystalker. i love his dragon mode robot mode not so much. Doubledealer93 wrote: i have amazon prime so if i order one i get free shipping. not sure about skystalker. i love his dragon mode robot mode not so much. He's quite awesome, I assure you. Ordered Skystalker, along with the Generations Prime and Bumblebee targetmasters. Got free shipping. Planning on going back for Ratchet and Dreadwing later. I was thinking the EXACT same thing, then I read this comment and LOLed. 4,702 pages were recently viewed by 755 unique visitors. This page was viewed 1 times on Thursday, April 25th 2019 11:05am CDT. © 2019 Seibertron, Inc. DBA Seibertron.com. All Rights Reserved. Established June 2000. Seibertron.com is owned by Ryan Yzquierdo.